And then there’s this ancient witticism, dressed up with a reaction GIF of Stanley from The Office. But if National Tell A Joke Day really wants to take off as an annual observance, what it needs is a central character to act as an ambassador to the world. Easter has the Easter Bunny. Christmas has Santa Claus. Independence Day has Uncle Sam. Et cetera. In all of popular culture, there can be no more appropriate spokesman for National Tell A Joke Day than Harvey Kneeslapper. Debuting in 1971 during the third season of Sesame Street, this aggressively obnoxious, lavender-skinned Muppet appeared throughout the 1970s and then very sporadically after that, finally being phased out in the early 1990s. 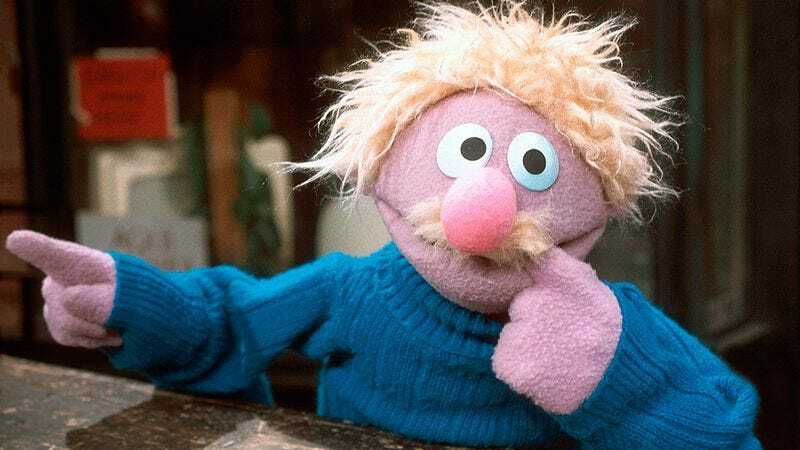 According to the 1998 book Sesame Street Unpaved, the character was dropped from the show because his raspy laugh was too taxing on performer Frank Oz. Nevertheless, Harvey’s bushy mustache, wildly unkempt hair, and disturbingly toothy smile are imprinted on the memories of a whole generation of Sesame Street viewers. This compilation captures the character at his best and worst. In keeping with the spirit of the holiday, Harvey certainly seems to be having fun. The same cannot be said for those around him, who regard his very approach with dread. In the early days, the character’s basic shtick involved sticking oversize letters and numbers to people’s clothing. Over time, however, he branched out to other forms of humor, including practical jokes. In one bizarre scenario, he actually tricks Kermit into standing outside for hours during a blizzard, until the poor frog is buried in snow and suffering from hypothermia. Hilarious. The character got to express his personal credo in a 1978 song called “Tell A Joke.” Here, he admits some frailty: “When I am feeling sad / When I am oh-so blue, pal / There’s one simple thing / I always try to do, pal / Tell a joke!” Amen, Harvey.